A quick update before I make my way to Swindon Festival of Poetry via lunch in Newbury with my sister-in-law. The Telltale Press public launch on Wednesday evening at the Poetry Cafe was a great success – the audience was mostly friends and friends of friends of myself and Peter Kenny, so we felt right at home. And the peeps at the Poetry Cafe are so helpful and unfussy. We’ll definitely be back in the New Year. Plans are afoot! Our guest readers on Wednesday were Anja Konig, all the way from Switzerland with her new pamphlet ‘Advice for an Only Child’ (Flipped Eye) hot off the press, and Rishi Dastidar, who’s part of the Complete Works II programme, launching on Monday evening at the South Bank. Then yesterday was National Poetry Day, with an avalanche of stuff on social media and a shedload of events, none of which I actually got to, but that’s mainly because of tiredness and in anticipation of a full-on poetry fest this weekend. I don’t know if it’s just my perception, but it feels as if NPD gets more mainstream coverage than it used to. Probably just my skewed viewpoint. 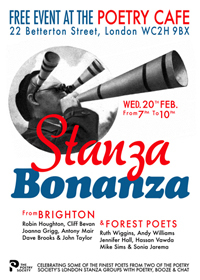 Somewhere in amongst all the excitement about Forward Prize winners, Next Gen Poets, NPD readings etc was the little announcement about the Stanza Poetry Competition, which I somehow managed to, er, win. (As a reward I get to read at the AGM of the Poetry Society at Keats’ House in November. I am absurdly excited about this.) It was lovely to receive emails and messages of congratulations from fellow poets. Thank you so much. The winning poems and judges comments are here. Thanks very much, Jayne 🙂 I’m feeling chilled already! Congrats Robin and hope you have a great weekend. I agree that NPD is getting more mainstream coverage ~ which is brilliant.